Calgary's Chinatown is a district of Calgary located along Centre Street in the northeast area of Downtown Calgary immediately north of the Downtown East Village. Calgary's Chinese Cultural Centre with its traditional architecture and decor (styled after the Temple of Heaven in Beijing ) is the largest facility of its kind in North America. The Dragon City Mall is also located in this district. The area along Centre Street north of downtown and continuing for several blocks is also very Asian-influenced and is often thought of as the city's second Chinatown. International Avenue is also a major multi-ethnic centre in the city's southeast with considerable Asian influence. The community has an area redevelopment plan in place. Chinatown Calgary Celebrates 100 Years In 2010, Calgary's Chinatown community celebrated 100 years of challenge, growth and prosperity on its way to becoming Canada's third largest Chinese community by population and its largest in area. But 100 years marks only the time since Chinatown settled in its permanent home in Calgary. Its actual history dates back to the mid-19th century when the struggles for Calgary's earliest Chinese citizens were just beginning. Railroaded by the Canadian Government Upon completion of the rail line to Canada's west coast (1885), the Canadian government reneged on its promise to provide Chinese rail workers return fare to their homeland. It also severely curtailed Chinese immigration, by way of a costly $500 head tax, leaving many displaced Chinese workers, predominately men, stranded in a strange land without their families. Strength in Unity Compelled to form protective and culturally supportive enclaves with their fellow countrymen, Calgary's first Chinese community took root beginning in the 1880s. It was located in the area of 8th Avenue and Centre Street on Calgary's eastern edge near the site of today's Glenbow Museum. A growing Chinese population, as well as a huge fire in 1886 that consumed much of the original Chinese district, forced the relocation of "Chinatown" south and west to 10th Avenue and 1st Street in the area today known as the "Beltline." Less than ten years later, the Canadian Pacific Railway announced its plan to run tracks between 9th and 10th Avenues, as well as building the Palliser Hotel (now the Fairmont Palliser Hotel) and a railway station between Centre and First Street S.W. Again Calgary's Chinese community was displaced as property owners took advantage of suddenly soaring land values in the area. In turn, around 1910, several prosperous Chinese merchants bought land in what today is the heart of Chinatown near 2nd Avenue and Centre Street south. City Council rejected a public call for a deliberately segregated Chinese community and elected only to pass a bylaw regulating sleeping and living space in houses. Over the next decade, many organizations such as the Chinese Public School, Chinese Mission, the Chinese National League and Chinese YMCA were established giving Calgary's Chinese community substance and a sense of permanency, although at the time its population was considerably less than 1,000. With the repeal of the Chinese Exclusion Act in 1947, the City's Chinese population soared, more than doubling between 1951 and 1961. Many Chinese newcomers, however, opted to live outside Chinatown and the community began to fall into disrepair. Growth Without Vision Since rising in its present location, Calgary's Chinatown evolved without any formal development plan. Then, in 1966, Chinatown's survival was again threatened when the City released a draft Downtown Master Plan which proposed a major freeway, known as the "east-west downtown penetrator" to run as an extension of Bow Trail through downtown between second and third avenues; directly through the heart of Chinatown. After years of debate, protests and revision, City Council adopted the three-part, Bow Trail Staging Report in February 1970 with construction of the "east-west downtown penetrator" scheduled to begin in 1978. Taking Control of Destiny In response to the newly adopted Bow Trail Staging Report with its "east-west downtown penetrator" making community devastation almost a certainty, Chinatown residents, merchants and businessmen rallied together through the leadership of Calgary's first Chinese-Canadian Alderman and then Member of the Legislature for Calgary McCall, George Ho Lem. At a packed meeting in the Chinese United Church on November 18, 1973, the Calgary Chinatown Development Task Force (CCDTF) was born, with the full support of the Chinese community. Brian Lee, a future Alderman and member of the Legislative Assembly, was recruited as its coordinator. Under the chairmanship of George Ho Lem, the CCDTF set out to fight the "downtown penetrator" and insure Chinatown's survival. Initially, the CCDTF was entirely funded by two Chinese community organizations, the United Calgary Chinatown Association and the Sien Lok Society of Calgary. Sien Lok was formed in 1968 and counts among its many achievements the creation of Chinatown's Sien Lok Park. The CCDTF assembled a broad coalition of community leaders who worked for three years to author the Chinatown Design Brief, a comprehensive plan, notable primarily for its exclusion of the east-west downtown penetrator as well as a call for substantial improvements to housing, schools and cultural facilities within its boundaries. The Chinatown Design Brief was formally approved by City Council on November 9, 1976, ensuring the future integrity of Chinatown. The 30th Anniversary of the approval of the document that saved Chinatown was celebrated on the same date in 2006 with over 30 of the original Task Force members in attendance to receive long overdue recognition for their contributions. More Victories for Chinatown The Chinatown Development Task Force also played a role in the building of the Oi Kwan Foundation's seniors' housing project and later doubling its capacity as well as the construction of Bowside Manor, a ten-storey public-housing apartment building for low income and elderly Chinese Calgarians. In a marvellous example of community cooperation, land for the building was secured when George Ho Lem convinced the Lee Family Association and the Calgary Chinese School, both in aging buildings on either side of a large vacant lot, to pool their resources. Together, they purchased the middle vacant lot and developed the entire parcel for the good of the community. The result, Bowside Manor, was approved under the National Housing Act, and opened in April 1980. Management was handed to the Calgary Chinatown Development Foundation where it remains today. In addition to housing hundreds of Chinese tenants, Bowside Manor remains home to the Calgary Chinese School and the Lee Family Association which celebrated its 100th Anniversary on May 23, 2010. Another of the task force's achievements was its role as mediator between Chinatown and Canada Public Works when the federal government expropriated crucial Chinatown land for the planned Harry Hays Federal Building. While the project went ahead as planned, a large number of displaced, low-income Chinatown residents were relocated to significantly improved housing elsewhere. 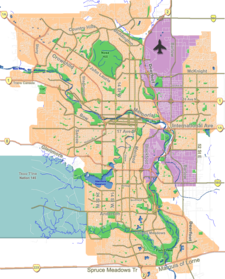 In the City of Calgary's 2012 municipal census, Chinatown had a population of 1,577 living in 1,381 dwellings, a 24.3% increase from its 2011 population of 1,269. With a land area of 0.2 km2 (0.077 sq mi), it had a population density of 7,8857,900/km2 (20,42020,000/sq mi) in 2012. Residents in this community had a median household income of $16,174 in 2000 (the lowest in the city), and there were 57% low income residents living in the neighbourhood. As of 2000, 92.1% of the residents were immigrants. A proportion of 98.6% of the buildings were condominiums or apartments, and 86% of the housing was used for renting. ^ Downtown Calgary Association (2005). "Downtown Districts". Archived from the original on 2007-10-06. Retrieved 2007-05-07. ^ Foran, Max (1982). Calgary, Canada's frontier metropolis : an illustrated history. Windsor Publications. p. 56. ISBN 0-89781-055-4. This page was last edited on 9 September 2018, at 06:11 (UTC).